Round = Traditional. Round-shaped diamonds are the most popular in the United States and considered a traditional, classic choice. The round brilliant cut has been around since the 1700s and has evolved over the years. Current brilliant cut diamonds have angles that enhance the gem’s fire and brilliance. A round cut diamond works well with almost any style of ring and in recent years has become extremely popular with a halo of round pavé or colored gemstones around it. Oval = Longevity. Oval diamonds have a long shape and a long history dating back to 1304. The oval brilliant cut became popular in the 1960’s. Its elongated shape often creates an illusion that the wearer’s finger is longer and that the diamond is larger. The oval also gives the wearer more individuality than a round because the stone can be set on either the narrow or wide side, depending on preference. Princess = On-Trend. Currently, a very fashionable cut for engagement rings, the princess‐cut diamond cut was created in the 1980s by Betzalel Ambar and Israel Itzkowitz. It has a refined, square shape that creates the look of a larger diamond. Like rounds, princess‐cut diamonds look great in almost any style of ring. However, it’s important to keep in mind that a princess‐cut diamond should always be set with prongs that protect the four corners (to prevent chipping). Marquise = Illusion. Named for the Marquise de Pompadour, mistress of Louis XV of France, the marquise-cut diamond resembles a football. Similar to the oval-cut (but with a point at the top and bottom of the stone) the long and narrow shape of the marquise can create an illusion that diamond is larger than it is. Symmetry is important with this shape, though. An improperly cut marquise can create and uneven, disproportionate look. Pear = Graceful. Combining a marquise and round, with a tapered point on one end, is the pear or tear-drop cut-diamond. Pear-shaped diamonds date to the 1400s, with the brilliant style being added in the 1700s. A diamond with a pear-cut also calls for excellent symmetry. Traditionally, with a pear-cut diamond, the point should always be directed out toward the fingers of the wearer. Emerald = Sparkle. Featuring an octagonal shape, the emerald-cut was first designed for its namesake green gem. The sparkly cut works quite well for diamonds too. Its smoothly beveled corners add visual appeal and provide a secure setting area for the prongs. However, due to the mirror-like look of this cut, a stone of very high quality is needed. In fact, traditionally, emerald-cut diamonds were only used for very large stones (that is not the case anymore). Asscher = Brilliant. A cross between a princess and emerald, the Asscher-cut diamond became popular in the early 2000s. The Asscher is a square cut, like the princess, but with facets like the emerald. It was first developed in Holland in 1902 by Joseph Asscher and, over the years, modifications were made that enhanced the shape’s brilliance. Radiant = Vibrant. The radiant-cut diamond is a relative newbie in the engagement ring arena. It gained popularity in the 1980s and is much like a princess cut, but with rounded corners. It’s designed to create a vibrant and lively diamond via its brilliant‐cut facet pattern on both the crown and pavilion. A radiant-cut requires more diamond mass, therefore a stone of high quality is essential. Cushion = Historic. The cushion‐cut diamond (also called the old mine cut or pillow) was the most common cut of diamond until the early 20th century. It was designed in the mid-1770s to retain as much diamond weight as possible. It boosts a square-cut with rounded corners, like a pillow. Cushions have a large number of facets on the surface and are often inset into rings, rather than sitting on top. Heart = Symbolic. For those that adore symbolism, is there anything that says “love” more than a heart-shaped diamond? While this cut may look simple, it’s actually very challenging for a diamond cutter to achieve. Therefore, if choosing a heart-shaped diamond, pay careful attention to symmetry – the two halves of the heart must be identical or the heart will look unbalanced. Due to the expertise involved in creating this fancy cut, heart‐shaped diamonds are typically not found in less than ½ carat sizes. 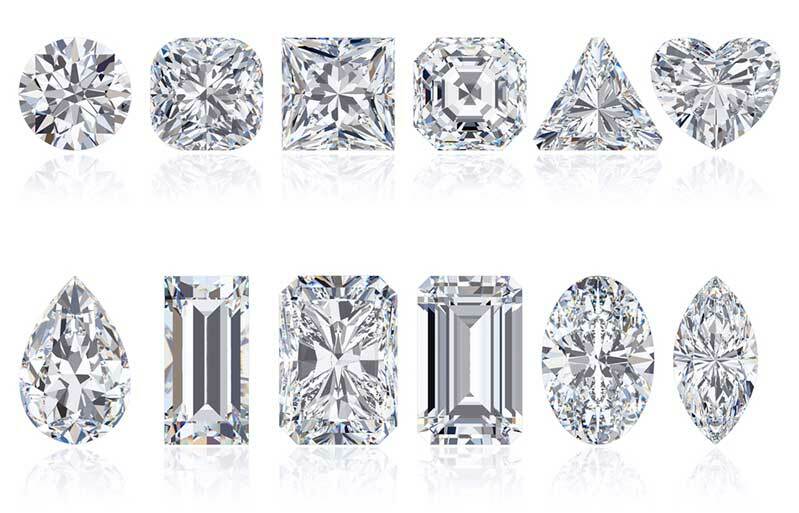 To learn more about diamonds and their rich myriad of shapes and what might be the best for you feel free to contact a diamond expert at MJ Gabel by calling us at (800) 804-1980 or by clicking here.